Can’t get enough of forex volatility? Rounding up this month’s set of monetary policy announcements are the highly anticipated Fed and BOJ statements. What are the two central bank hotshots up to and what can you expect from the events? Last month, those who were expecting a June rate hike were left disappointed when Janet Yellen and her gang decided to keep their current policies steady for another month. In the presser that followed, Fed head honcho Janet Yellen hinted that the downgrades in GDP projections were due to risks such as sluggish business investment, a possible Brexit, and weaker-than-expected labor market. Meanwhile, their inflation estimates were upgraded on the back of expected improvements in the labor market and the fading away of the “transitory effects” in energy prices. Last and most importantly, the Fed’s dot plot charts reflected fewer members who are expecting at least two rate hikes for this year and the next. Since then the June NFP report came in better-than-expected, retail sales and core inflation popped up, and manufacturing and services PMIs showed improvements. Even Britain’s vote to exit the EU didn’t affect the U.S. markets as negatively as the Fed projected. Heck, the U.S. equities even hit record highs since the referendum! The improvements in Uncle Sam’s top tier reports, as well as the limited impact of Brexit on the U.S. markets, are the main reasons why market players aren’t expecting changes from the Fed this week. In fact, the central bank will likely maintain its data-dependent stance and refrain from hinting any rate hike schedule. That doesn’t mean you shouldn’t stick around for the event though! Look out for hints on whether or not the June NFP has changed the Fed’s view on labor market growth (the details did look weaker than the headlines) and whether the members still feel the need to closely monitor “global economic and financial developments” following the EU referendum. As expected, the BOJ chose to stand pat last month, mostly because it was waiting for Japan’s elections and the impact of its negative interest rate policy implemented earlier this year. It did mention weakening growth in its major trading partners though, saying that they’re affecting Japan’s production and exports. The lack of action, though expected, fueled the yen’s rally further, as it hinted that the central bank isn’t too worried about the yen’s post-Brexit levels. Fast forward to today after Shinzo Abe and his Liberal Democratic Party have won the elections and the Prime Minister wasted no time drafting another set of government stimulus to achieve their growth targets. Ben Bernanke had a guest appearance and terms like “helicopter money” were thrown around. The Finance Ministry hinted that the package could be as big as 3 trillion JPY though it hasn’t stopped the market grapevines from blowing up their speculations to as high as 20-30 trillion JPY. The latest updates put the more realistic forecasts to 6 trillion JPY, with 2 trillion expected to be added to the supplementary budget this year. Abe’s Cabinet is expected to muddle through the proposed projects and reach decisions as early as August 2. In the meantime, Finance Minister Taro Aso and BOJ Governor Kuroda are working hard to contain market expectations. Aso shared that the government has yet to decide on the size of the package and that monetary policy measures should be left to the BOJ. Meanwhile, Kuroda is bringing down the hype by saying that the economy is seeing a “moderate recovery” and that there are more definitions to the term “helicopter money.” Maybe he wants to be called “Bullet Train Kuroda” instead? With risk aversion diminishing and the yen back to its levels during the last BOJ announcement, the central bank has a bit more time to wait for Abe’s Cabinet to make decisions on the size and scope of its fiscal stimulus. The BOJ could choose to wait until the government’s chess pieces are in place before launching the next set of monetary stimulus. Watch out for possible jawboning though! The central bank could compensate for the lack of policy changes by being more optimistic on the economy or making strong statements about the yen’s strength (not that they would work). Can’t ignore the high expectations in place! The BOJ could choose to do SOMETHING over nothing in the face of heightened market expectations and just hint at further stimulus down the road. This is a dangerous move for the BOJ, as watered down plans have the tendency to push the yen higher in the charts. The BOJ could start Abenomics 2.0 with a bang and fire up its tools to help achieve its 2.0% inflation target. Popular options include increasing ETF and JGB purchases and dragging its main interest rates further into negative territory, from -0.1% to -0.2%. Whatever tools the BOJ chooses, they have to be large enough to make an impact or at least impress market players enough into selling the yen across the board. 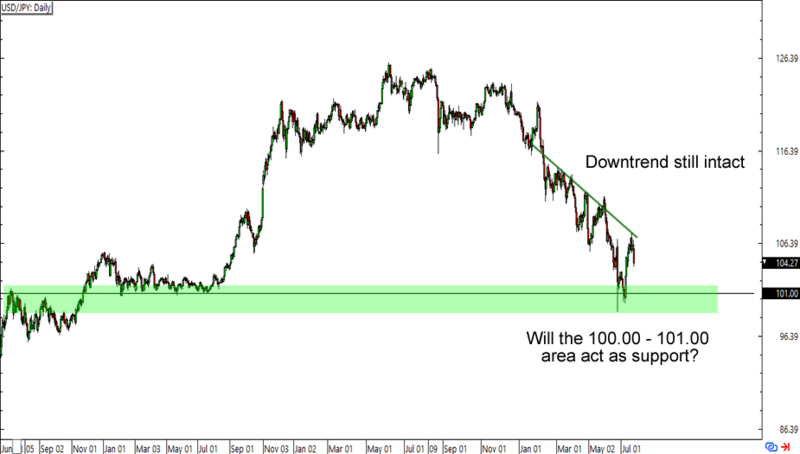 The events above are putting USD/JPY under a big spotlight this week. A lack of changes in the Fed’s plans or a watered down plan from the BOJ could extend the pair’s downtrend all the way to the 100.00 -101.00 levels. On the other hand, a hawkish FOMC statement or an aggressive stimulus plan from the BOJ could break the falling trend on the daily chart and suggest that the 100.00 handle is the pair’s bottom for the year. What do you think? Will the Fed make any changes this month? How about the BOJ? Got any guesses as to the direction of both the dollar and the yen given the scenarios above?